It's got GPS but does it impress? 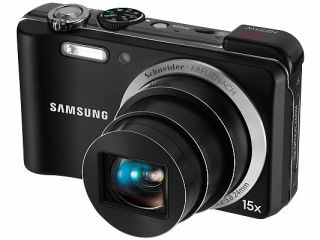 Samsung has unveiled its latest camera range for 2010 and with it, a number of interesting photo-related features. TechRadar managed to get a little hands-on time with the Samsung WB650 range and we have to consider ourselves impressed. Packing a 12.2MP sensor – plenty of pixel power for the average user – the camera manages to be easy enough to use for the amateur but powerful enough for enthusiasts. The WB650 is a good deal thicker than its ST70 stablemate but this camera is all about functionality rather than style. This can be seen in the camera's zoom lens. It's one of the biggest seen on a camera of this size (Samsung is boasting of a world's first), bringing a whopping 15x optical zoom to proceedings. This isn't where the innovations end, though. Samsung has decided to add a little bit of GPS to the camera, which means you will be able to geo-tag your images. We had a quick go and it seemed to work well. There's a nice map graphic as well which can be accessed. On it you can have pointers to all the places you have been with the camera, and access to the pictures you took in the relevant place. There are murmurings, however, that using the GPS capabilities of the camera will seriously hamper battery life (by around a third). Luckily the WB650 has been given an OLED screen, which means low battery consumption and super-bright colours. As you can see from the image taken (see below), the 3-inch AMOLED display is definitely bright even in quite poorly lit situations. There's a number of features you can use with the WB650 – including an Optical IS function and a 720p movie mode. Both of which round up a decent shooter for Samsung and one which we can't wait to get into the building for an in-depth review. The Samsung WB650 and WB600 (which comes sans OLED screen) range will be out in March and will be priced at £299.99 and £249.99 respectively.